1 The lune (rhymes with moon) is a very short poem. It's similar to the popular haiku form of poetry. While a haiku follows a 5/7/5 syllable pattern, the lune's syllable pattern is 5/3/5. Typically, since the middle line is restricted to three syllables, it is the shortest line of the three. 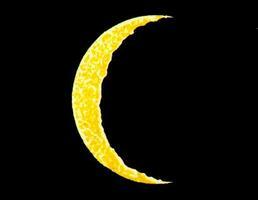 This gives the lune a curve on the right side similar to a crescent moon.